Have you ever wanted to hold a little piece of the impossible? The Doldrums is an extraordinary debut about friendship, imagination, and the yearning for adventure from author-artist Nicholas Gannon. With the hardcover edition lavishly illustrated in full color, The Doldrums is a modern classic in the making, for readers of inventive and timeless authors such as Brian Selznick and Lemony Snicket. Archer B. Helmsley wants an adventure. No, he needs an adventure. His grandparents were famous explorers . . . until they got stuck on an iceberg. Now Archer’s mother barely lets him out of the house. As if that would stop a true Helmsley. Archer enlists Adelaide—the girl who, according to rumor, lost her leg to a crocodile—and Oliver—the boy next door—to help him rescue his grandparents. 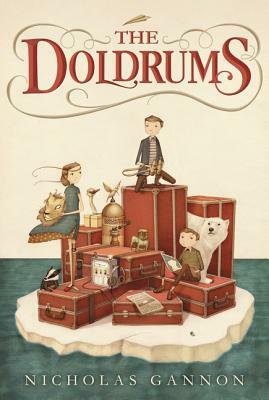 The Doldrums whisks us off on an adventure full of sly humor, incredible detail, and enormous heart. With approximately twenty pieces of breathtaking full-color artwork, as well as black-and-white spot illustrations, and gorgeous, literary writing, Nicholas Gannon proves himself to be a distinctive new voice with his middle grade debut. Be in it for the limitless imagination. For the characters who capture your heart. For the rich world you’ll want to settle into. But most of all, be in it for the friendship. That, after all, is the true adventure. The Doldrums is delightful! What a wonderful ride of a book!